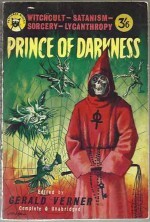 *Science Fiction, Fantasy & Horror: COWER PUNY MORTALS FOR I AM THE PRINCE OF DARKNESS! 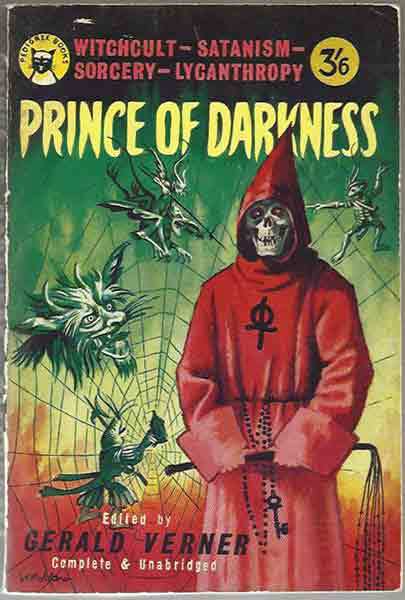 Well, strictly speaking, today’s tome is Prince Of Darkness, an anthology of evil edited by Gerald Verner. Forewarned is forearmed, as the saying goes, and this book will let you face Halloween or any other occult occasion with sang froid rather than your blood running cold. Featuring works by Algernon Blackwood, John Buchan, Margaret Irwin, F G Loring, Cotton Mather (who chronicled the Salem witch trials), Sax Rohmer, Saki, Dorothy L Sayers, Montague Summers and Gerald Verner himself (who also wrote as Donald Stuart) the book covers Witchcults, Satanism, Sorcery and Lycanthropy. This is a very rare edition from 1960 in VG grade at £70.